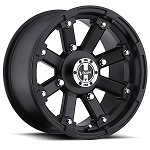 Vision ATV Wheels at Pure Offroad! Vision has been in business since the early 80's. 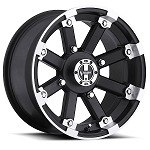 They are one of the largest aftermarket manufacturer's of both Automotive and Off-road ATV & Side by Side rims. 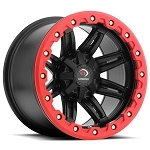 Their wheels feature very unique styles that you can't find with other wheel companies. 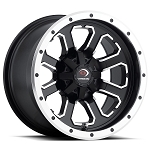 Another great thing about Vision is most of their rims are available in 7 inch widths for the front and 8 inch widths for the rear. 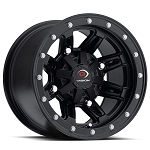 We've noticed that most of our customers really like this option as it makes your rear rims & tires a little wider giving the aggressive look your ATV or Side by Side was meant to have. 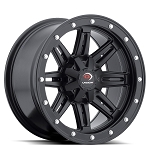 Most machines come stock from the factory with wider rims on the rear so if you are trying to maintain that look Vision is an excellent option. We carry Vision's full line and as a dealer we can get any of their products including Automotive, give us a call if you can't find the Vision product you are looking for. We've got a helpful and knowledgeable staff waiting to help you with your next Vision wheel purchase.